zBoost ZB575-V TRIO SOHO Tri Band Verizon 4G Cell Phone Signal Booster, up to 2,500 sq. ft. Assembled here in USA with Worldwide parts. Factory closeout. Uses TV type cable like high grade RG-6 or RG-59. Great for any 3 G repeater systems 850 Mhz 1900 Mhz at 5 Dbi gain. (Reduced performance on newer 4G bands). ZBOOST WI-EX YX500-CEL Cell Phone Signal Booster. ZBoost YX550-VLTE-AWS SOHO DataBlast for Verizon 4G LTE and AWS. zBoost DataBlast boosts indoor signal up to 2500 sq. ft. It's easy to set up and includes everything you need to create a fast connection. Satisfy all your cellular phone needs with the Wireless Extenders YX510-PCS/CEL zBoost zP Wireless Booster, which works with both cellular frequencies (800 and 1900 MHz) and can extend cellular coverage up to 2500 square feet. You need to provide coax cable to connect antenna to booster. Booster unit is missing 2 of the little plastic dots on bottom (sits on them but no effect on proper unit function). Condition is New ( never opened). ZBoost TRIO SOHO cell phone signal booster boosts indoor signal for voice and Verizon 4G data signals up to 2,500 sq. ft.The zBoost TRIO SOHO boosts Verizon 4G LTE as well as voice and text for all major carriers. Wall screws not included. This antenna can work anywhere on earth, compatible with all cellular voice and data bands. All data and cellular uses are compatible. It is made in USA of top grade materials. Manual not included, free download from zBoost website. No further testing done. This is a factory direct blemished item closeout. The rear alumuinum plate has minor scratches, glue marks and other smudges. Antenna is new and unused but blemished. The antenna has an F type female connector and includes mounting bracket as shown. ZBoost SB HSPA vehicle cell phone call signal booster help boost AT&T iPhone X XR XS 8 7 Plus 6s SE phone. Box was opened but everything inside is new. It carries full zBoost USA warranty. (Phone not included). 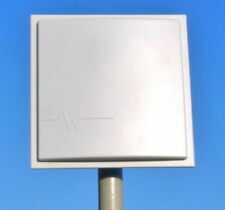 The wide radio wave beam width directional antenna receives signal from multiple cell towers. Wi-Ex zBoost. Increases indoor signal coverage for a single level up to 3500 sq ft. Increases voice and data transmission speed on cell phones, smartphones, wireless data cards and wireless alarm panels. YX699- Product Specifications Connectors RF: SMA (female) – PCS and CEL RF input. It is factory sealed with full zBoost USA warranty. (Phone not included). Omni-directional outside antenna can receives signals from multiple cell towers. The antenna can be installed outdoor above roof line for best performance or indoors in attic or near a window for convenient. 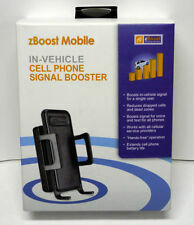 ZBoost SB HSPA vehicle cell phone call signal booster help boost Straight Talk wireless cellular service. It is factory sealed with full zBoost USA warranty. (Phone not included). 1 unit - zBoost SB HSPA cell phone signal booster. ZBoost SB HSPA vehicle cell phone call signal booster for Apple iPhone X 8 7 Plus SE 6s 6s Plus 5 5s 5c phones. It is factory sealed with full zBoost USA warranty. (Phone not included). 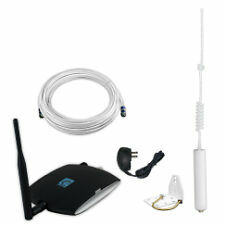 1 unit - zBoost SB HSPA cell phone signal booster. 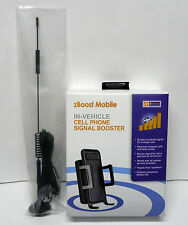 ZBoost SB HSPA vehicle cell phone call signal booster help boost wireless cellular service. It is factory sealed with full zBoost USA warranty. (Phone not included). 1 unit - zBoost SB HSPA cell phone signal booster. SAY GOODBYE TO DROPPED CALLS, POOR CALL QUALITY, AND SLOW INTERNET. Enhances talk, text, and basic 3G internet on ALL phones with ALL carriers indoors. No more dropped calls, lost connections, and slow internet. Zboost Yx-500 Pcs Cell Phone Signal Extender, Booster, Wi-ex Directional. It is factory sealed with full zBoost USA warranty. (Phone not included). 1 unit - zBoost SB H HSPA cell phone signal booster. Built into the signal booster cradle is a bi-directional amplifier and a phone battery charging port for your cell phone. Wi-Ex Cell Phone Signal Extendor. FACTORY SEALED. Condition is Used. Shipped with USPS Priority Mail. The Wi-Ex zBoost Directional Indoor Wall-Mount Antenna is made for use with select zBoost cell phone signal boosters. 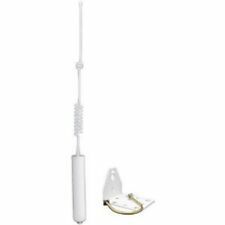 This antenna is designed to mount with the cable facing down and includes mounting hardware. It is factory sealed with full zBoost USA warranty. (Phone not included). Built into the signal booster cradle is a bi-directional amplifier and a phone battery charging port for your cell phone. 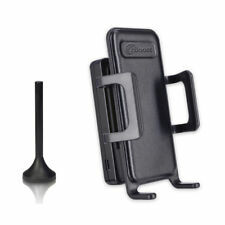 The booster is ideal for hands free voice calls when used with a Bluetooth headset. ZBoost SB XR HSPA extra range vehicle cell phone call signal booster with extra range antenna help boost Straight Talk wireless cellular service. It is factory sealed with full zBoost USA warranty. Magazine, YahooTECH and HGTV Pro. zBoost-ONE, theFIRST ONE PIECE cell phone signal booster actuallySYNCS to your carrier to reduce dropped calls and increase call clarity. It is very easy to set up.